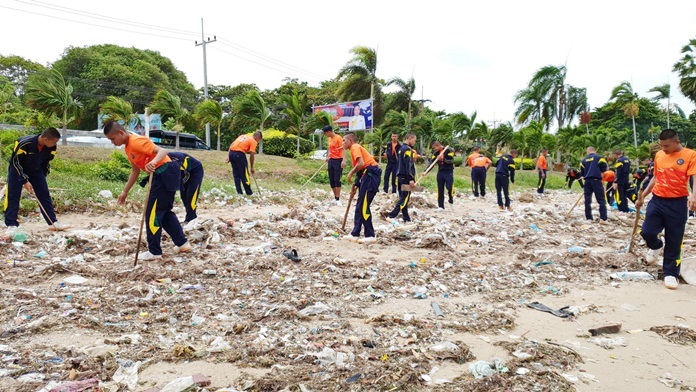 Sailors, students and scuba divers cleaned up beaches and the sea in Sattahip as part of a royal conservation project. Deputy ACDC commander Capt. Surayuth Nivetthongruk opened the July 25 event dedicated to HRH Princess Sirivannavari Nariratana, who launched a campaign to clean up Thailand’s seas. About 300 naval personnel joined students from Plutaluang Wittaya and Juksamet schools as well as members of the Diving for Conservative Club. Capt. Surayuth said that undersea garbage collecting was organized to comply with a suggestion by the Princess to conserve marine life and coral.